Mined minerals are essential to many sectors of the economy, from information technology to renewable energy. The mining industry extracts, refines, consumes, and safely disposes of thousands of tons of minerals every day and is regulated by numerous state and federal agencies to protect public health and the environment. Monitoring for metals (common byproducts of mineral mining) in ground and surface waters falls under the broad scope of the environmental services and testing market, a $1.9 billion market in the U.S. alone. Current testing protocols for potential contamination involve collecting a soil or water sample, sending it to a central laboratory, and waiting anywhere from days to weeks for results. To ensure that waterways have not been contaminated, or that remediation is effective and efficient, frequent and timely chemical analyses are critical. There is a significant need for inexpensive and rapid analytical testing so that workers can make quick site assessments. Enabled by funding from the National Science Foundation, Access Sensor Technologies (AST), a Fort Collins-based company, has recently developed a technology that addresses the need for rapid, affordable, on-site testing for contaminants. Costing an order of magnitude less than comparable lab analyses, AST’s On-Target test cards quantify dissolved metal cations within minutes with high sensitivity and selectivity. The technology is simple, portable, and requires no power or external reading equipment. ▲ The On-Target test card can evaluate metal content of contaminated water in two easy steps. First, place the aqueous sample in the center of the target. Next, read the concentration (in ppm) of the metal using the printed metrics. On-Target test cards are manufactured using state-of-the-art, proprietary printing technologies. The test cards are made of filter paper, and hydrophobic barrier printing technology is used to selectively pattern reagents with well-established color chemistries on the paper. When a few microliters of aqueous sample are placed at the center of the printed test circle, target ions in the sample react with chemicals on the card to produce a color change. The test cards are safe to use, do not generate any hazardous waste, use an order-of-magnitude less reagents than lab tests, and provide results within three minutes. The cards have a printed calibration scale that relates the concentration of the target ion to the diameter of the color change in the test zone. On-Target tests can accurately quantify concentrations from 0.1 ppm to 100 ppm, and with pre-concentration can detect contaminant levels down to single ppb levels. ▲ A pre-concentration system can be used to concentrate the analyte of interest into a much smaller volume. In this way, On-Target test cards can be used to detect metals in the ppb range. AST has also developed a pre-concentration system to use with the On-Target test cards. This pre-concentration system uses specifically tailored analyte-trapping membranes to concentrate the analyte of interest into a much smaller volume. For example, more than 95% of the dissolved copper in a liter of sample can be concentrated into a single milliliter. The pre-concentrator is smaller than a backpack, can be powered in the field with a compact battery, and pre-concentrates a sample in six minutes. More-expensive lab analysis techniques such as atomic absorption spectroscopy (AAS) are typically required to detect concentrations this low. 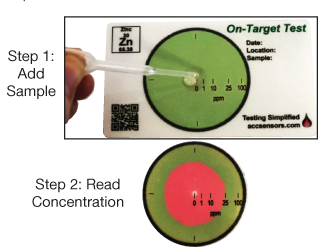 “The On-Target test cards are a quick and simple way to collect contamination profiles and assess sites during remediation projects. This technology has great potential to expedite our future projects,” says Jim Harrington, president of Alexco Environmental Group, an industry leader in environmental consulting services and site management. Tests for copper, iron, and zinc are available now, and tests for additional analytes will be available later in 2018. Currently, remediation has been the focus and largest market for On-Target test cards. 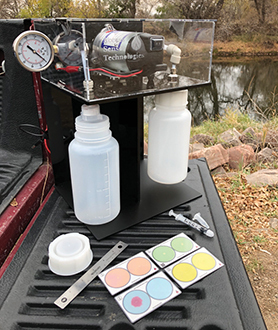 The test cards are intuitive and easy to operate and are rapidly gaining attention for industrial wastewater, home water quality, and pool water quality applications. This technology was funded through the NSF Small Business Innovation Research Program.